Needed to take a break from making Christmas cards and chose a very large floral image from Penny Black, called Garden Gems, to make a thank you card. The nice thing about these large images is that you can just rub some ink over them, use waterbased markers to produce a more realistic image, emboss and water color around them, or try other techniques. But my favorite thing about them is that Penny Black has done all the work --no masking or figuring out where the leaves go. 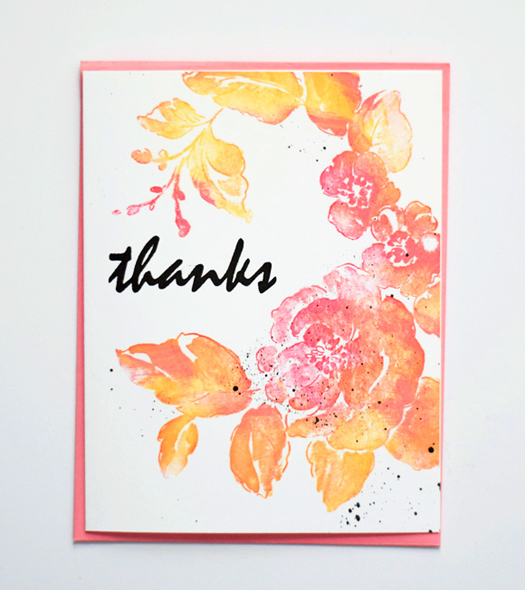 Used various shades of pink and orange inks and just lightly stamped portions of the image several times. The MISTI or other positioning tool makes this very easy. Added a sentiment from Altenew and some black speckled paint. Before I added the paint, I covered up most of the card with scrap paper. MOOD WHEN DONE: Good! The card is about to go in the mail. Then it is time to clean up this mess before I go back to making Christmas cards. Hope to have more to share soon. 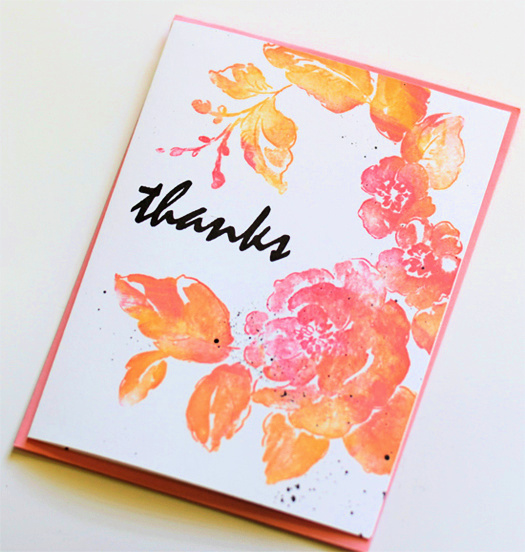 love the pink and orange together - lucky person to receive such a pretty card. There's just something about pink and orange that transports me back to the 70's Joan! This is much prettier, however! Gorgeous card. I love the pink and orange together, and sometimes I throw in a little yellow. I think those are my 3 favorite colors (at the moment, at least). this is stunning! and what a gorgeous image. Smart idea to cover up parts of the card before doing the ink splatter; I never thought of that. I can't even. This is way too gorgeous for words. If ever there was a reason for a MISTI, this is it. I've held out, still using my SU Stamp-a-Ma-Jig, but it's not enough for this type of application. The pinks and oranges blend so beautifully here to create all the different shades. And, yes, I'll take a whole stamp, please, rather than have to mask and arrange the parts myself. Exquisite, Joan. I'm in awe. That is SO pretty, I would have mass produced several and keep them on hand!